A new e-book reflecting SWET member involvement has recently been published. SWET writer and editor Ted Taylor is co-editor of Deep Kyoto: Walks, along with Michael Lambe. 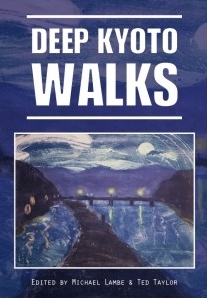 At the Deep Kyoto site, Lambe describes it as “both a literary tribute to the city as home and a testament to the art of walking for its own sake,” with each of the walks taking the form of a “meditative stroll around an area the writer knew intimately.” The book highlights neighborhood walks, mountain hikes, bar crawls, backstreet rambles, philosophical wanderings, and strolls down memory lane, all contributed by authors deeply conversant with the Kyoto scene, including John Dougill, Pico Iyer, Chris Rowthorn, and SWET member Judith Clancy. Specifically, there are 18 walks to enjoy, 16 photographic illustrations, a woodblock printed image by Richard Steiner, 12 detailed maps, links to all locations on Google Maps, and cover art by internationally acclaimed artist, Sarah Brayer. The book is now for sale via Amazon.